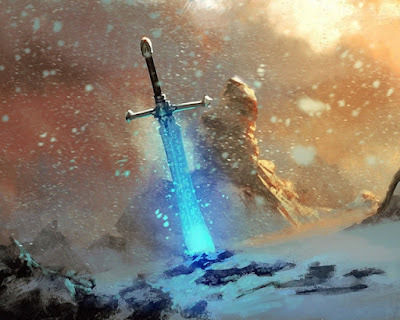 In the old game, 20% of all magic items are swords. Only Fighting-Men can use swords. They all talk and they all have personalities. They all have special powers to be discovered. They all have cool lore for me to invent later on. It actually take a little bit of time to craft an AWESOME magic sword worthy of the name. So I put together a little list of a few for when they hit the treasure hoards. At some point if this becomes a really important thing to the players, I may even decide to place them rather than rolling them randomly. Because we're doing race as class, I think that Fighting-Men, Dwarfs, Elfs and Hobbits will all be able to use magic swords. But Dwarfs won't be able to use Claymores and Hobbits will only be able to use Backswords, on account of their smaller sizes. But here are the first three swords that will hit the table as we play. Forged by the ancient Dandol people, long departed from this realm. When the wielder’s HP fall below 11, roll d6. On a 6 the sword takes over. Int 9 +1, Ego 5. +1 sword. When the wielder’s HP falls below 14, roll d6. On a 6 the sword takes over. Int 7, Ego 2. +1 sword. When the wielder’s HP falls below 9, roll 1d6. On a 6, the sword takes over.